WASHINGTON, DC, February 2, 2011 (ENS) – A massive winter storm that stretches across 20 states has closed roads and airports and downed power lines, leaving hundreds of thousands of people without electricity at the peak of the storm. Local emergency authorities and the National Weather Service continue to warn the public to stay off the roads. Travel has been and continues to be treacherous and in many areas is impossible. High winds, sub-zero wind chill and icing conditions will challenge restoration efforts into the next 24 hours. The blizzard has been blowing across the country from the Southwest and is dumping snow on the Northeast tonight, continuing into Thursday. New York City is under an ice storm warning issued by the National Weather Service until 9:00 Thursday morning, with more than a half an inch of ice predicted to accumulate on sidewalks and roads. New York City public schools and government offices will be open Thursday despite expected mass transit delays. During the peak of the morning rush hour city roads and sidewalks will be slippery and dangerous, emergency officials warn. In Boston, Mayor Thomas Menino is urging caution in the flash freezing conditions, causing very dangerous road conditions and impacting the evening commute. Chicago officials counted this as the third-largest snow storm ever to hit the region. 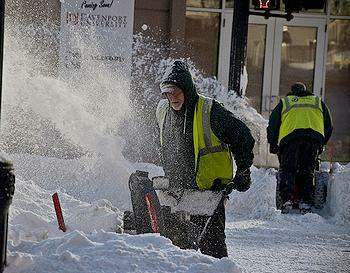 The blizzard began Tuesday afternoon and persisted through Wednesday morning, burying the city under two feet of snow. 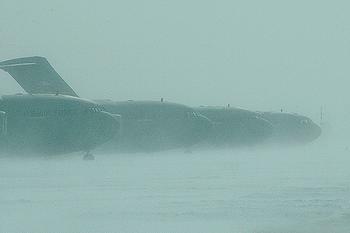 Strong winds of up to 70 miles per hour piled drifts six feet high in some places. Tonight temperatures plunged to zero with a wind chill measuring 20 to 30 degrees below zero. Police closed Lake Shore Drive Tuesday night but not before a series of accidents stranded many motorists, requiring the rescue of “hundreds of people,” according to Ray Orozco, Mayor Richard Daley’s chief of staff. The Chicago Fire Department and the Department of Streets and Sanitation rescued and moved hundreds of people out of their cars and off Lake Shore Drive. 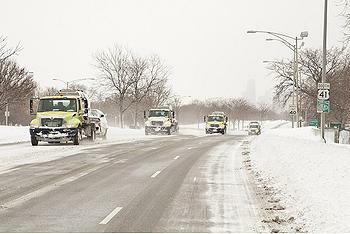 The city is working to get vehicles towed off Lake Shore Drive and clear it so it can eventually be re-opened when it’s determined to be safe to do so. “We will continue doing everything we can to protect the safety of people as we deal with the impact of this historic storm, the likes of which we haven’t seen in decades,” Orozco added. Lake effect snow arrived this morning and added another three to five inches to the snow cover. Winds gusting up to 70 mph caused damage to the roof of the press box at Wrigley Field, the 97-year-old baseball park that is home to the Chicago Cubs. Surrounding streets were closed off Tuesday night as a precautionary measure. While all airports are technically open tonight, no planes are flying in or out of either Chicago airport. On the ground the Chicago Transit Authority was able to maintain rail service overnight through the worst of the storm, although with some delays. Almost all of the Illinois expressways are “impassable,” with freeway ramps swamped under three to four feet of drifting snow, according to the Illinois State Police. ComEd has more than 300 crews working around the clock to restore power for approximately 28,000 customers without power across Illinois. More than 190,000 customers have been impacted by the blizzard that swept through the company’s service territory overnight and today. The power company Ameren, which serves 1.2 million electric and 813,000 natural gas customers in downstate Illinois, and thousands more in Missouri, says its crews have experienced drifting snow up to 15 feet high. Ameren Illinois field teams are relying on heavy equipment, including road graders, to access areas for repair, restoring service to critical facilities such as nursing homes, fire stations and municipal water infrastructure. Iowa is digging out, but gusty winds persist in eastern Iowa, causing many roads to remain closed and others to close today, according to the Iowa Department of Transportation. The storm dropped only a few inches of snow in the Lincoln, Nebraska area, but the ice that ahead of it and the 40 mph wind gusts that followed made a mess of streets, county roads and highways, emergency officials said. The American Red Cross is working in 19 states, offering food, comfort and a safe place to stay to storm-affected people. As of midnight last night, 73 shelters were open in nine states with additional shelters on standby as the storm system moves to the Northeast. In Chicago, more than 360 people spent the night in Red Cross shelters. In Tulsa, Oklahoma, Red Cross disaster workers housed 70 people overnight who could not make it home due to the storm. Five Red Cross disaster warehouses are on alert, ready to ship supplies wherever they are needed. IHS Global Insight, a Boston-based economics consulting firm, found that states can lose hundreds of millions of dollars in economic opportunity for each day it is shuttered by impassable roads. 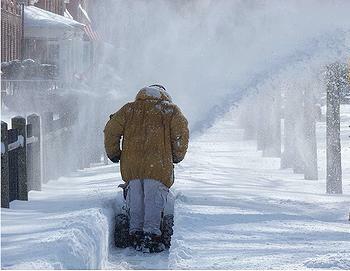 The study examined the economic impact of snowstorms in 16 U.S. states and two Canadian provinces. 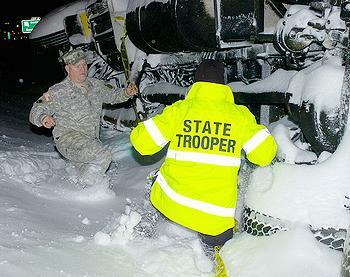 It showed a one-day major snowstorm can cost a state $300 to $700 million in both direct and indirect costs.